Vegan stuffed shells stuffed with an almond tofu spinach ricotta and topped with a rich and delicious marinara sauce and baked. Ideal comfort food. Put the pasta on to cook according to package directions but only cook them until al dente or just before. They need to be firm for stuffing. When your almond ricotta is made, add the full batch to the food processor and add the tofu (broken into pieces), chopped baby spinach, chopped parsley, garlic powder, onion powder, salt and black pepper. Process until everything is well mixed. If your mixture goes a little green from the spinach, this is fine. When the shells are al dente, drain and rinse. Add 1 cup (240ml) of marinara sauce to the bottom of a 9×13 baking dish and spread it evenly across the bottom. Stuff the shells using a spoon and stuff each one to the brim so that you use up all the filling. 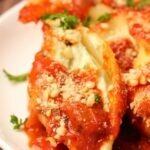 Place the stuffed shells into the 9×13 dish on top of the marinara sauce. When all the shells are in, pour over the remaining marinara sauce. Cover the dish with foil and place into the oven to bake for 25 minutes, then remove the foil and return to the oven to bake for 10 minutes uncovered. Sprinkle with vegan parmesan cheese (optional) and serve. *Note that the full batch of almond ricotta that you need to make for this recipe requires soaking the slivered almonds for 1 hour in hot water. So get that on the go before you start with the rest of this recipe. *Use any great tasting marinara sauce. *Nutritional information does not include vegan parmesan cheese on top.